WAYJO’s immensely talented and passionate Artistic Team are the foundation of our program. They provide the knowledge, musicianship and inspiration for our orchestras, ensuring that each musician develops and improves their skills throughout the year. Mace has been involved with WAYJO since 2000 as both a musician and Musical Director. 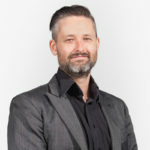 Mace Francis is a passionate advocate of original Australian large ensemble jazz music, forming his own 14-piece ensemble in 2005 – the Mace Francis Orchestra (MFO). MFO have recorded 6 CDs, toured nationally four times and performed with international artists Jim Pugh (USA), Jon Gordon (NY), John Hollenbeck (NY), Satoko Fujii (JAP), Ed Partyka (GER) and Theo Bleckmann (NY). For his compositions Mace has been awarded an APRA Professional Development Award, the Italian international composition prize, “Scrivere in Jazz”, was a finalist in the 2010 Freedman Jazz Fellowship, nominated for an Australian Bell Award (2013 & 2016) and was the 2015 winner of the APRA Jazz Work of the Year. Mace has worked as guest composer and conductor with l’Orcehstre des Jeunes Jazzmen de Bourgogne (France), the Graz Composers Ensemble (Austria) and the Showa University of Music Big Band (Japan). Mace currently works as the artistic director of the WA Youth Jazz Orchestra and has recently completed a PhD exploring site-specific composition of which he received the 2015 Faculty Research Medal. For the past 20 years Marty has performed as a musician, taught brass and improvisation in several WA schools, directed large school and community ensembles, composed, arranged and recorded professionally. Marty’s musical versatility has enabled him to engage in a diverse range of genres from New Orleans style brass (Chameleon Brass Band), Latin (Sabroson), jazz (Hip Mo Toast), dub (Sunshine Brothers), funk/soul (Funk Club House Band and P Family), original music (Cinema Prague, Prawns with Horns and Air Ensemble) and recent performances with Renee Geyer and Paul Grabowski. 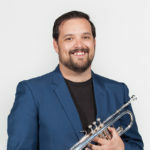 Ricki Malet started on trumpet at age 10 and was accepted into the West Australian Academy of Performing Arts (WAAPA) at age 15 where he completed his Bachelor of Music in 2003. Over the last 20 years he has performed all over Perth (including a residency with his quartet at the Moon Café for 13 years) with various bands covering lots of different styles and has toured extensively, with tours to Europe in 2002 with Original Band Prawns with Horns, New York in 2006 with the West Australian Youth Jazz Orchestra (WAYJO), Melbourne in 2006 with the Mace Francis Orchestra (MFO) and in 2007 with Funk outfit The Roast as well as Australian tours with MFO in 2008, 2010, 2011 & 2013 and the Daniel Susnjar Afro-Peruvian Jazz Group in 2017. Most recently Ricki has played and recorded with the Australian National Jazz Orchestra at the Sydney Con Jazz Festival in June 2017. He has recorded 5 albums with MFO, 2 albums with trad jazz group The Hounds and most recently released an album and an EP with his ‘electric band’ Fat Sparrow in 2015 and 2017. In addition he features on tracks with many other groups including Daniel Susnjar’s Afro-Peruvian Jazz Group, Descarga, Prawns with Horns, Drapht, Optamus, Odette Mercy and her Soul Atomics, Saritah and more. 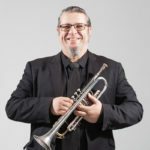 Ricki has taught trumpet and conducted ensembles in schools around Perth since 2003 and in 2010 he took a sessional staff role at the West Australian Academy of Performing Arts (WAAPA) teaching trumpet, ensembles and improvisation classes in the jazz department. Also in 2012 he accepted a Musical Director position with WAYJO conducting one of the 3 bands in the organisation and has been involved with the Brubeck Institute, AB Music and Essentially Ellington due to the relationships WAYJO has built. WAYJO’s Artistic Advisory Committee is a valuable source of expert assistance in the areas of jazz, big band music, industry networks and the music business. We are very proud to have such a distinguished team of musicians on hand to help WAYJO.